Subject Guides are a good starting point for accessing key resources for your research. Google Scholar Library Links connect you to full text via UNSW Library, when available. Go to Scholar Settings to select UNSW Library as your Library Link. You’re used to searching online, but are you finding what you need for your assignments and research? A search engine, like Google, is a good place to start, but it’s only a small part of what’s available to you. If you’re looking for scholarly content, there are alternatives you can try. 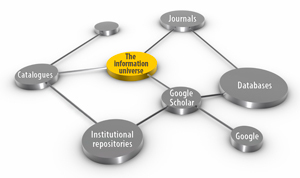 Google Scholar can link you to literature such as journal articles, books and conference papers. Check the Library website on how to set up links to UNSW Library. A database is a collection of published content, such as journals, newspaper articles, conference proceedings, reports and book chapters. The Library provides you with access to many of the best globally recognised databases in a wide number of subject areas. A search in the Library collection provides journal article level access to much of the content you need. Library collection provides records for all the items UNSW Library holds. You can access UNSW Library's collection anywhere in the world, connecting you to e-books, e-journals, images, videos and databases. Every time you search, you will be looking for different information. You can always ask at a Library Help Zone if you don’t think you’ve found the right tool to access what you need. A library database is a collection of published literature, such as journal and newspaper articles, conference proceedings, reports and book chapters. Databases can be subject specific or multidisciplinary. They can also be subscription or open access. Searching a library database is a good way to find scholarly information. Many important databases require users to pay for access to their content. Libraries subscribe to these databases and access to each individual database is subject to licence agreements. This means that only currently enrolled students and staff have access to UNSW Library subscription databases. Some databases are open access, providing free access to selected scholarly journal articles, theses, scholarly monographs and book chapters. Some examples of UNSW open access databases are PubMed, Eric and Biomed Central. ejournals, digitised content such as images and documents and databases. Library catalogues can be searched online from anywhere in the world, helping you discover what is held in a Library’s collection. Learn about the different types of resources you can use to search for information. This helps you understand which resources will be the most appropriate to use when you are searching for information for your assignments. Google is a fast, easy way to search for information, ranging from the very general to the scholarly. It is important to carefully evaluate any information you find through Google. If you are specifically searching for scholarly information, it can save you time to first search library resources such as databases, journals and catalogues. Journals publish articles that provide scholarly information. Many journal articles are peer-reviewed which means they are reviewed by experts in the author's field of research. Journals are generally published regularly and are issued on an ongoing basis. When researching a topic, journal articles can be an excellent source for current, scholarly information. Many journals are subscription-based. Most university libraries subscribe to a wide range of academic journals, enabling access for the university community. People who are not affiliated with a university can subscribe to journals themselves. Some journals are open access, providing free access to their content, so you won't be required to log in or pay for their journal articles. Sometimes access to the most recent open access journal articles is delayed for a specific time period. Google Scholar can link you to scholarly literature such as journal articles, books and conference papers. Not all academic material will be available via Google Scholar. Searching library resources such as databases can be a more thorough way of checking the literature in a subject area, ensuring you don't miss key information.